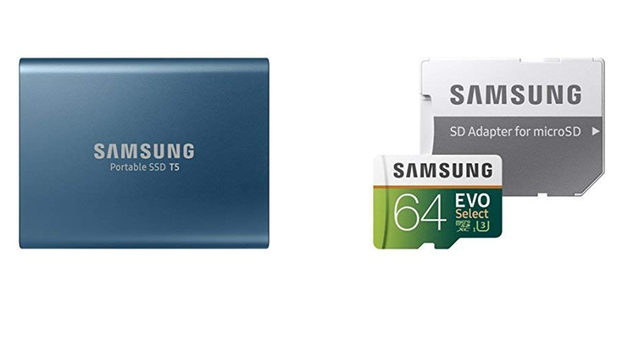 The Samsung T5 portable SSD offers 250GB of storage in one compact form; with a weight of less than two ounces, this is storage you can take anywhere. Its shock-resistant design can handle drops up to two meters, while its USB 3.1 Type-C port will let you connect to a wide variety of devices. And with read-write speeds of 540 MB/s, you can transfer data quickly. We named this SSD as our favorite external performance drive, awarding it 4.5 stars out of 5 for its super-fast speeds, great performance, and conveniently small size. The MicroSDXC Evo Select memory card brings 64GB of storage with an included adapter for increased compatibility. Its read speeds of up to 100 MB/s and write speeds up to 60 MB/s provide fast transfers. In addition, a durable design will help keep your data safe. We haven't reviewed this memory card ourselves, but it's a mainstay in our Android reviewer's phones and a huge hit on Amazon, with 4.6 stars out of 5 over more than 9,000 user reviews.